Monday  Our luxury coach will depart this morning and travel to our Eurotunnel crossing. Once in Calais we journey straight to our hotel in Boppard with suitable comfort stops on route. We will arrive at our hotel with plenty of time to settle in before dinner. Tuesday  Today we head for Cologne, with its Christmas markets in front of its famous landmark cathedral. With the festive scents of gingerbread, roasted chestnuts and mulled wine, explore 150 attractively designed wooden pavilions all hosting beautiful crafted gifts and delicious foods to get you in the Christmas spirit. This afternoon we return to the hotel for coffee and cake. Wednesday  A free morning in Boppard. You may wish to join the group for a short-guided walk, before our 3-course lunch at the hotel. 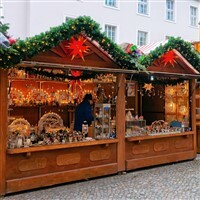 Later this afternoon as dusk falls we visit the beautiful Christmas markets of Rüdesheim to experience the magical atmosphere of the markets lit up at night. Thursday  This morning we are visiting Koblenz with its six tranquil old town squares and over 100 festive and glittering Christmas houses. Germanys oldest city turns into a strolling paradise for romantics at Christmas time. This afternoon we continue to Cochem on the Moselle where advent magic awaits. At the Reichsburg Castle, the Christmas story is re-enacted in a nativity play featuring real farmyard animals. Time to browse this lovely town with a smaller market, however the advent tent in the square welcomes you for Christmas drink and a chance to get warm! Friday  We leave Germany today and head back to Calais for our Eurotunnel crossing back to Wiltshire after a memorable festive break.